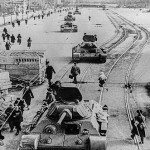 The protracted and brutal war that laid waste one of Asia’s most ravishingly beautiful countries was a classic example of a Cold War conflict. In the early 1960s US foreign policy was in thrall to the ‘domino theory’, which held that if one country were to fall under the communist spell, neighboring states were bound to follow suit. After the 1954 division of Vietnam into North and South at the 17th parallel, the communist North, under charismatic leader Ho Chi Minh, continued to pursue its goal of national unity by infiltrating South Vietnam with troops and arms; thus began a bitter civil war that was to last 16 years. Although fearful of the spread of communism, the USA restricted its initial involvement to supplying the South Vietnamese army with military advisers but when Lyndon Johnson assumed the presidency following Kennedy’s assassination he quickly raised the stakes by ordering bombing raids against North Vietnam. In March 1965 the first American ground troops landed in South Vietnam; numbers steadily increased until by the end of 1968 they had reached over half a million. In January of that year Ho Chi Minh launched the Tet offensive, a massive combined assault by the North Vietnamese army and the Viet Cong (as the guerrillas fighting in the South were known) which took the Americans completely by surprise. Although they ultimately beat back the assault, the offensive marked the turning point of the war. Peace talks started in Paris soon afterwards and eventually, in 1973, a ceasefire was agreed, involving the complete withdrawal of US troops. Just two years later the North invaded the South; now without US support, its government capitulated rapidly. Vietnam was once again united, but under a communist flag, and the myth of an invincible America had been shattered. Death toll: 58,193 US troops were killed or listed as missing in action. It is thought as many as 250,000 South Vietnamese soldiers died. Combined North Vietnamese and Viet Cong losses are estimated at over 1,000,000. In addition to the horrendous military loss of life, around 4,000,000 Vietnamese civilians (10 per cent of the population) were killed or injured during the war. The country’s economy and infrastructure were destroyed and its ecology suffered devastating and irreversible damage. You should know: Key factors in the North’s ultimate victory were its use of guerrilla tactics and the Viet Cong’s success in winning the ‘hearts and minds’ of the rural peasantry in the South who disliked the regime in Saigon. Lying only 300 km (200 mi) from the US mainland, the Caribbean island of Cuba had become an increasingly irritable thorn in America’s side since Fidel Castro had led a popular revolution in 1959 to overthrow the dictatorship of General Batista. Castro helped to finance the socialist policies he introduced, including universal health care and free education, by nationalizing US-owned businesses in Cuba. America’s response was to impose a crippling trade embargo and to cut all diplomatic ties. The loss of influence and commercial opportunities in Cuba continued to rankle, and the embers of resentment were fan the large population of Cuban exiles in Florida: supporter beneficiaries of the old regime who had fled the island. In 1 CIA devised a covert plan to use these exiles to oust Castro and restore a pro-American government. This became one of the first issues confronting the new president, John F Kennedy, when he took office in January 1961. Kennedy initially was unconvinced but was persuaded to sanction the operation when a smokescreen of ‘plausible deniability’ was put in place to protect his reputation. Following a successful US bombing raid on Cuba’s airfields, on April 17 1961 five US merchant ships landed 1,500 armed Cuban exiles in the Bay of Pigs, an inlet on Cuba’s south coast 145 km (90 mi) southeast of Havana. The operation was bungled from the outset: two transports were sunk, jeeps were landed without fuel, the troops had inadequate maps of the island and ended up firing on each other. Worst of all, the CIA’s assumption that the invasion would spark a popular uprising against Castro proved a disastrous misjudgment. The invaders were soon surrounded and pinned down on the beach by Castro’s militia; within 72 hours they had all surrendered. Death toll: 118 members of the invasion force were killed and over 1,200 taken prisoner. Although the Cuban military prevailed, its losses were high; over 2,000 soldiers were killed, wounded or listed as missing in action. 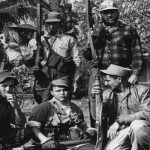 You should know: The Bay of Pigs operation was a strategic as well as a military fiasco inasmuch as it drove Fidel Castro even further into the welcoming arms of the Russians. Just 18 months later the world narrowly avoided nuclear catastrophe in the Cuban Missile Crisis. As Fat Man and Little Boy brought World War II to its nuclear end, former colonial powers elbowed their way through coalitions of tribal, sectarian and nationalist interests to fill the power vacuum left by the defeated Japanese throughout the Far East. In Vietnam, France found itself violently opposed by the Viet Minh, a nationalist force that had resisted the Japanese with the hope of simultaneously kicking out their colonialist overlords. Led by Ho Chi Minh, an inspirational leader trained in both Paris and Moscow, the Viet Minh were old-school communists, and thoroughly accustomed to the self-sacrifice demanded by a common weal. With the legendary Vo Nguyen Giap as their military commander, and a stubborn reluctance to be bullied, the Viet Minh evolved into a field army capable of bringing their enemy to battle almost where and whenever they chose. Dien Bien Phu was the climax of their seven-year war. Dien Bien Phu was ‘the key to Laos’, a crossroads in the mountainous northwest of Vietnam. As soon as the French began to fortify it, Giap saw his chance. The battle – essentially between outmoded Staff College tactics and what we now recognize as ‘modern’, combined operations based on information and close support – included ambush, hit-and-run, artillery siege, extended trench warfare, and brilliantly extemporized opportunism. It lasted 55 days. Giap’s military genius won a decisive victory that Ho Chi Minh, in the Geneva Accords of 1954, was able to translate into France’s permanent withdrawal from Vietnam, Laos and Cambodia. France’s military and political disaster was eventually equalled by Vietnam’s. The Accords also partitioned the country at the 17th parallel, handing South Vietnam to one of history’s most corrupt figures, US-backed President Diem. 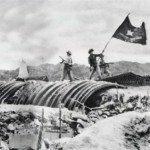 By 1959, Giap and Ho Chi Minh had it all to do again. And they did. Death toll: Only 70 French soldiers escaped Dien Bien Phu to Laos, leaving 2,293 killed, 5,195 wounded, and 10,998 captured (of whom only 3,290 were ever repatriated). Viet Minh casualties were (estimated) at 23,000. You should know: For all their public protestations, the US was covertly and intimately involved with French military and political strategy at Dien Bien Phu. There is French evidence to suggest the US discussed ‘lending atomic bombs’ in their support; and in 2004-2005 it became known that at least 37 US pilots flew 682 missions, and two were killed in action during the battle. On February 25 2005 the seven US pilots still living were invested as members of the Legion d’Honneur by the French Ambassador to the USA. In the months following D-Day in June 1944 the success of the Allies in driving Germany out of France and Belgium made them increasingly confident the war could be brought to a swift conclusion, perhaps by the end of the year even. With Allied forces now close to the Dutch border the British commander, General Montgomery, came up with an audacious plan. 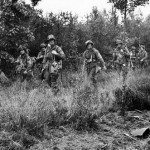 Montgomery believed that a powerful, narrow thrust deep into the German lines would be more effective than an advance on a broad front. The plan, code-named Operation Market Garden, would involve the largest airborne offensive in the history of warfare, with around 35000 men being parachuted behind enemy lines. The key objective was to capture a number of strategic bridges spanning the waterways on the Dutch/German border, thus opening the way for a rapid assault on the Ruhr, Germany’s industrial heartland. On September 17 in clear blue skies some 1,500 aircraft and 500 gliders dropped the first wave of 10,300 paratroopers of the British 1st Airborne Division close to the town of Arnhem in occupied Holland. Hopes were high, but the operation had already been compromised by a lack of planes which meant three separate lifts would be needed to transport the entire force. Once the paratroopers had captured the bridges they would be relieved by more heavily armed ground forces advancing north from Belgium. Some bridgeheads were indeed established, but German resistance was stiffer and better organized than expected. Only one parachute battalion reached the ultimate objective, the bridge over the Rhine at Arnhem. Vastly outnumbered and outgunned, the 700 British soldiers held the bridge’s northern end for four heroic days waiting for the relief force to arrive before being overrun. The Germans recaptured the bridge and Operation Market Garden had failed. Death toll: 1,300 men of the 1st Airborne Division were killed at Arnhem and over 6,400 captured, only 2,400 British and Polish paratroopers – less than a quarter of the original landing force – were rescued when the area was evacuated by the Allies and the operation abandoned. German losses are estimated to have been at least 1,500. You should know: The 1st Airborne Division was so badly hit by casualties at Arnhem that it ceased to exist as a fighting unit and was never reconstituted, it would be another four months before the Allies crossed the Rhine again for the final offensive against Germany. Soon after the evacuation from Dunkirk in 1940, Combined Operations Headquarters was set up to harass the all-conquering Germans by any means possible. Combined Ops was taken over by Lord Louis Mountbatten in 1941 and a major success was achieved in March 1942 when a British seaborne assault on St Nazaire put the strategically important dry dock out of action. Thus emboldened, a further attack on the French coast was planned. Operation Rutter would evaluate the possibility of capturing and briefly holding a port, also testing invasion techniques, destroying valuable equipment and gaining useful intelligence from captured Germans. This time the target would be the port of Dieppe. Unfortunately, on the very day of departure – July 5 1942 – German bombers attacked the assembled fleet and Operation R was aborted. Undeterred, Mountbatten revived and modified the plan as Operation Jubilee. It was an ill-starred initiative, as the Dieppe raid would turn out to be a major military reverse. On August 19 around 6,000 Canadian infantrymen went ashore from landing craft on the town beach, supported by new Churchill tanks, even as flanking British commandos and US army rangers attacked gun batteries on the headlands. Overhead, Allied fighter aircraft waited to pounce when the Luftwaffe was drawn into the fray. The attack went in at 05.00 and was dogged by bad luck, poor planning and lack of communication. By 09.00 it was all over and Allied forces retreated, confirming the painful World War I adage that it’s easier (and safer) to defend than attack. 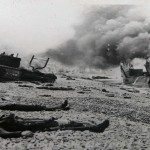 The Royal Navy’s bombardment had been ineffectual, 119 Allied aircraft were shot down (against 46 Luftwaffe planes), the 58 Churchill tanks couldn’t get off the beach and half were lost. Casualties were heavy and the Dieppe raid went down in history as a disastrous debacle. Death toll: Precise figures are not known, but around 1,000 Allied soldiers were killed (mainly Canadians), plus some 550 Royal Navy personnel. German losses were in the low hundreds. You should know: The only Allied success during the Dieppe raid was the copybook attack by the British army’s No. 4 Commando under Simon Fraser, 15th Lord Lovat. The well-trained commandos stormed ashore on Orange Beach and destroyed their target – a German coastal battery on the right flank of the main landing – before returning safely to England having suffered only minor casualties.